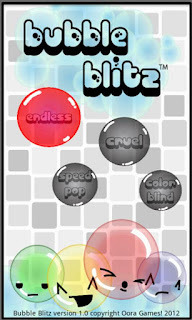 Bubble Blitz (and Bubble Blitz Demo) by Oora Games is a fun, chirpy game for Android. 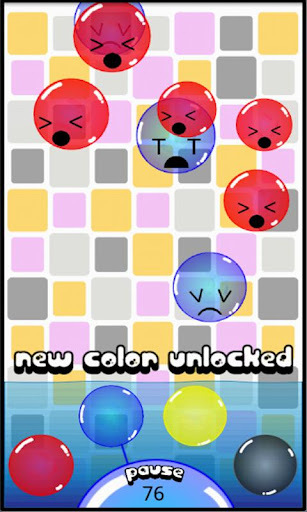 In Bubble Blitz, players must pop the brightly colored, cute, yet expressive bubbles before they hit the water line. The more bubbles you pop, the higher your score, so get poppin'! Bubble Blitz offers 4 unique game modes. There's Endless (self explanatory), Cruel (unlockable and difficult), Color Blind (color changing), and Speed Pop (timed). Each game mode offers a fun little twist on the core game play and definitely adds to the replay value. In addition to all of its solid game modes, Bubble Blitz is Swarm-enabled and it offers leaderboards to keep track of top scores. Finally, the development team over at Oora Games went the extra mile and added character animations as well as an original sound track. Check out the free Bubble Blitz Demo, and if you're happy with what you find, then show Oora some love and buy the full version!